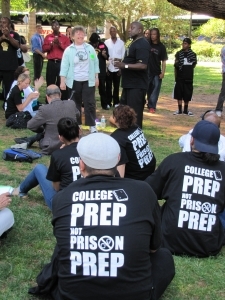 Monday, May 13th marked the first formerly incarcerated people’s lobby day at the California State Capitol with more than one hundred formerly incarcerated youth and adults from around the state. During what they called the “People’s Quest for Democracy,” groups lobbied legislators on polices that impact the ability of formerly incarcerated people to fully participate in society. Many of the bill authors made time to speak to the group, including Assemblymembers Roger Dickinson (D-Sacramento), Reggie Jones-Sawyer (D-South LA), and Shirley Weber (D-San Diego), and Senators Richardo Lara (D-Long Beach) and Leland Yee (D-San Francisco). AB 149 (Weber, Greenlining Sponsored) – would require the Department of Corrections and parole and probation officers to notify individuals of their right to vote and provide voter registration opportunities as they become eligible. AB 218 (Dickinson) – would prohibit state government agencies from asking job applicants about their criminal history. AB 870 (Jones-Sawyer) – would prohibit firms contracted by state government agencies from asking job applicants about their criminal history. SB 283 (Hancock) – would allow people with a drug felony conviction after 1997, to still qualify for CalWORKS and/or CalFresh programs as long as they comply with the terms of their supervised release and participate in a drug treatment program. Click here for a full list of bills we are supporting or opposing. The People’s Quest for Democracy day was organized by a number of organizations including All of Us or None, Legal Services for Prisoners with Children, The Center for Young Women’s Development (San Francisco), Communities United for Restorative Youth Justice/CURYJ (Oakland), Project Safe Return (Richmond) Fathers & Families of San Joaquin (Stockton), the Youth Justice Coalition, A New Way of Life (Los Angeles) and others.